[S500] Allan J. Gillis, "Descendants of Angus "The Miller" MacFarlane # 74," e-mail to Donald James MacFarlane, October 11, 2005, page 9. [S941] 1921 Canada Census, MacDougall # 0559. [S861] Ancestry.com, online www.ancestry.com, 0861 - 0603 - James Murdock MacDougall.docx. [S861] Ancestry.com, online www.ancestry.com, 0861 - 0609a - James Glen MacDougall.docx. [S861] Ancestry.com, online www.ancestry.com, 0861 - 0603a - James Murdock MacDougall.docx. [S429] Obituaries from The Halifax Chronicle Herald Newspaper, Obituary of Margaret Jane Beaton, September 16, 2002. [S500] Allan J. Gillis, "Descendants of Angus "The Miller" MacFarlane # 74," e-mail to Donald James MacFarlane, October 11, 2005, page 18. [S861] Ancestry.com, online www.ancestry.com, 0861 - 0609 - James Glen MacDougall.docx. Language*: Jessie Ann MacFarlane spoke English. Married Name: As of 10 October 1927,her married name was MacKinnon. [S9] Births, Church Record, June 1977 to September 1944 St. Joseph's Church, Margaree, Records, page 42, line 2. Year: 1911; Census Place: 23, Inverness, Nova Scotia; Page: 5; Family No: 44. [S5] Marriage, Church Record, November 1884 to September 1935 St. Joseph's Church, Margaree, Records, page 105, line 1. 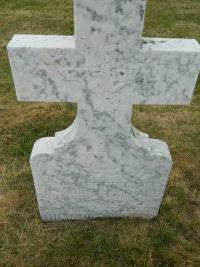 [S653] Catholic Cemetery, Inverness County Nova Scotia, online unknown url, Headstone of Jessie MacFarlane. [S653] Catholic Cemetery, Inverness County Nova Scotia, online unknown url. [S427] CBGHA, online www.cbgha.org, Excerpts from 2012-November. [S100] Obituaries from The Casket Newspaper, 1852 - present, Obituary of James A. MacFarlane, a 10 March 1930. [S709] Diocese of Antigonish, Nova Scotia, Canada , Birth record of Margaret Elizabeth Gillis, page 310. Biography*: Archy was living in Dunvegan at the time of his marriage. The 1881 Census lists him as a farmer and fisherman. According to the 1891 census Archibald could both read & write. From "History of Inverness County"
Even in his youth he was both intelligent and obedient. He was born in Morar in 1805 and died in dunvegan in 1900. In his mere boyhood he took to fishing as well as farming, and was specially successful in the latter pursuit. It used to be said that he had peculiar luck as a fisherman; but in our experience the man is usually Captain of his own luck. Wolfes Island, now Margaree Island, was always a capital fishing station. It is said that Archibald MacLellan was the first white man who slept there. He not only fished himself, but also bought the fish from other fishermen, and had it conveyed to market in French schooners. He also built a wharf on the Island. When the fishing season ended he returned to the farm where he stayed and worked till the sea called him again the following spring. In this way Archibald became very comfortable." "This Archibald MacLellan was a gifted man with some education. In his old age he took to writing in verse. He composed some Gaelic songs and hymns which, according to some competent judges, invoke the graces of the Muses. Had he been trained in that poetic pusuit he might have ranked among the celebrities of song." This son, being the oldest, was his father’s first help in the wilderness, and he did help from a very early age. Even in his youth he was both intelligent and obedient. He was born in Morar in 1805 and died at Dunvegan in 1900. In his mere boyhood he took to fishing as well as farming, and was specially successful in the latter pursuit. It .used to be said that he had peculiar luck as a fisherman; but in our experience the man is usually the Captain of his own luck. Wolfes Island, now Margaree Island, was always a capital fishing station. It is said that Archibald MacLellan was the first white man who slept there. He not only fished himself, but also bought the fish from other fishermen, and had it conveyed to market in French schooners. He also built a wharf on the Island. When the fishing season ended he returned to the farm where he stayed and worked till the sea called him again the following spring. In this way Archibald became very comfortable. [S241] South River, John Cameron & his Descendants, November 12, 1914. [S363] 1881 Canada Federal Census, 101 Newbury Street, Boston, Suffolk, Massachusetts, USA. [S1] J. L. MacDougall History of Inveness County, page 372. [S520] April 1891 Canada Federal Census, 101 Newbury Street, Boston, Suffolk, Massachusetts, USA. [S100] Obituaries from The Casket Newspaper, 1852 - present, Obituary of Mary MacFarlane, 53-1905-20-5. [S709] Diocese of Antigonish, Nova Scotia, Canada , Baptismal record of Marian McLellan, page 89. [S949] 1871 Canada Census, MacLellan # 0629. [S818] J. R. Reid, Descendants of Angus MacLellan # 8701, page 3. [S818] J. R. Reid, Descendants of Angus MacLellan # 8701, page 15. [S100] Obituaries from The Casket Newspaper, 1852 - present, Obituary of Neil MacLellan, February 23, 1922. [S818] J. R. Reid, Descendants of Angus MacLellan # 8701, page 21.